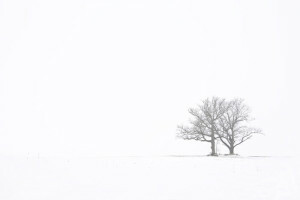 On a very cold winter’s morning in Lansing, Michigan, I was driving on Chandler Road when I noticed two oaks standing close together in a pasture. From the weather report, I knew that there was a good chance that the next morning would be gauzy. I decided right then and there that I wanted to photography those oaks; I was hoping to create an elegant, atmospheric, and minimalistic image. Chandler Road is a two-lane country route. No paved shoulders exist. In fact, the edges of the road drop off quickly from the pavement’s edge. In order to stand reasonably comfortably, I knew that I’d need to set up my tripod as close to the road as possible. I also knew that, especially in a foggy situation, I’d have to keep a sharp eye out for vehicles. I would be almost invisible to drivers. Almost every time that a car or truck appeared out of the cottony blanket coating the countryside, I’d quickly clamber down the snowy embankment to a place of safety. When they zoomed past, I’d climb back up to my tripod and resume shooting. It took some time, but I finally obtained the shot I wanted. I have taken special care in printing this artwork to preserve the gentle atmospheric conditions of the day. The scattering of grasses near the oaks suggests a horizon where otherwise none exists. 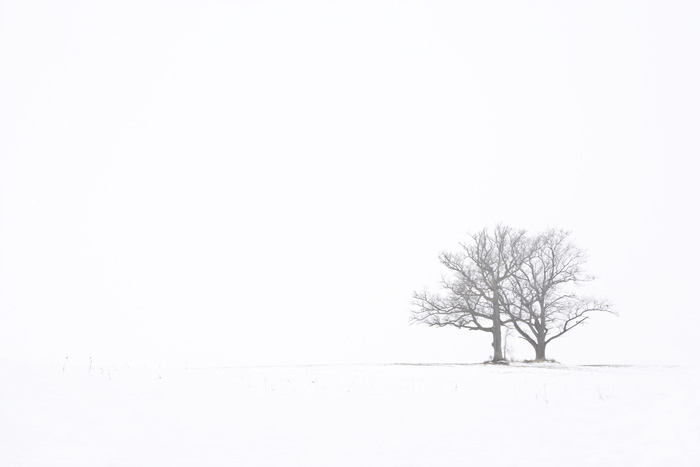 And the oaks themselves, softly rounded, offer rounded shapes and a touch of texture in a smooth field of gauzy winter white.